Racoviteanu, A., Y. Arnaud, M. Williams, J. Ordonez (2008). 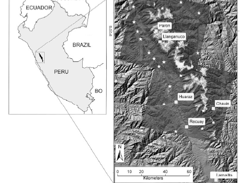 "Decadal changes in glacier parameters in teh Cordillera Blanca, Peru, derived from remote sensing. "Journal of Glaciology 54(186): 499-510. -Derived new glacier outlines from 2003 SPOT images and ingested them into GLIMS. -Melting of glaciers in Andes poses a threat to water resources for the region, GLOFS too. -Hypsometry – Measurement of land elevation relative to sea level – wiki. -They used ground GCP’s for orthorectifying the satellite scenes and validation of the digital elevation data but our DEM is from LiDAR which used GCP’s so we can rectify off that accurately. – Good to make a note of this in research writeup. -The NDSI method developed by Hall in 1995 was the best method of band combinations based off evaluation of color composites. -This study digitized the debris-covered ice manually, again using a slope map derived from the DEM and a color composite map – SPOT bands 2, 3, 4 (RGB). -They used a threshold value of .5 on the band ratio scale of -1 to 1 to obtain a binary map of glaciers/non-glaciers. This description seems vague to me. -It is important that I follow the WGMS standards in my writeup for definitions of “glacier”. I’ve downloaded the tutorial by Bruce Raup and will be reading it shortly and trying to follow its standards. -Are there any previous studies of the glaciers of Hood or Rainier that go into detail about the slope and aspect of the glaciers? I will be using LiDAR from 2007-2008 for Hood and Rainier but are there any DEM’s from the early 80’s or 90’s that I could use to contrast the changes in slope/aspect etc. That may be interesting. At the end they explain why the used the 1970 one to minimize bias from two different ones but note that it ignores potential changes in glacier elevations that may have occurred since the 1970s. -This study had a 1970 inventory and DEM and used the 1970 DEM for construction glacier hypsographies of the 1970 and 2003 inventories to calculate area, terminus elevation, max elev, min elev, med elev, avg slop and avg aspect. -I like how they used frequency diagrams of glacier size – perhaps I could do this with Hood and Rainier too and look at how the frequency distributions change over time. I’d need to figure out how to do this in GIS. -The area of the study has much more smaller glaciers <1km2 showing that the area may be particularly sensitive to small changes in climate. This may be too broad of an inference for my study of just two volcanoes because they studied 485 glaciers. -I really like the frequency diagrams of elevation shifts, area loss compared to glacier size, and aspect frequency distribution. I will try to re-create these for both Hood and Rainier. -This study found the greatest decrease in size for small glaciers but with high variability ranging from 2% to 90% loss. They explain this with several factors. -They also found that glaciers on lower summits are losing more area Compare Hood to Rainier. -Smaller glaciers with smaller altitudinal ranges are also losing more area. -Clean glacier tongues seem to lose area at a faster rate than debris-covered glacial tongues. -Found an upward trend over 30 years of temps but temps rose faster at lower elevations. Perhaps compare the temperature trend at lower elevation Hood compared to Paradise…? -The study relates glacier retreat in the region to warm dry phases of ENSO. -The paper classifies possible error well and asserts that topographic effects from different solar illumination is minimized by the NDSI classification method. -They note the largest source of error is from the 1970 inventory that was created from photos, hand digitizing etc. world. US Geol. Surv. Prof. Pap. 1386-K.
J.G. Ferrigno, eds. Satellite image atlas of glaciers of the world. US Geol. Surv. Prof. Pap. 1386-I, 151–179. 2002. J. Glaciol., 51(175), 539–546. Racoviteanu, A., W.F. Manley, Y. Arnaud and M. Williams. 2007.
an example from Nevado Coropuna, Peruvian Andes. Global Planet. Change, 59(1–4), 110–125. 1996) of the Cordillera Blanca (Peru) using satellite imagery. Remote Sens. Environ., 95(3), 342–350. mountain glaciers using SRTM and map-based topographic data. IEEE Trans. Geosci. Remote Sens., 44(10), 2991–2995.